All bookings must be Saturday to Saturday during the months of March to September! REMODELED BATHS AND MASTER BEDROOM March 2009! New bedroom, dining and living room furniture, new windows, doors, floors, carpeting, appliances, ceiling fans and granite countertops plus 55 inch flat screen TV have updated this unit to be one of the best in Captain's Walk! Breathtaking views of the Atlantic Ocean and pool from the private balcony of this fourth floor spacious villa. You will just LOVE the view of the pool, palm trees, dunes, beach and ocean! Captain's Walk is located in beautiful Palmetto Dunes and is conveniently located on the bike path between the Marriott and Hilton Hotels. The Fazio Golf Course, Palmetto Dunes Tennis Center, bike, kyack, rowboat and canoe rentals are all within walking distance. Other beautiful golf courses are a short distance away. Last but not least is the fabulous beach! Enjoy the beautiful sounds of the ocean from the king-size bed in the master bedroom suite or from the balcony of the spacious living/dining room. Even the kitchen has a great ocean view! Two double beds in the second bedroom and queen convertible sofa in the living room complete the picture! 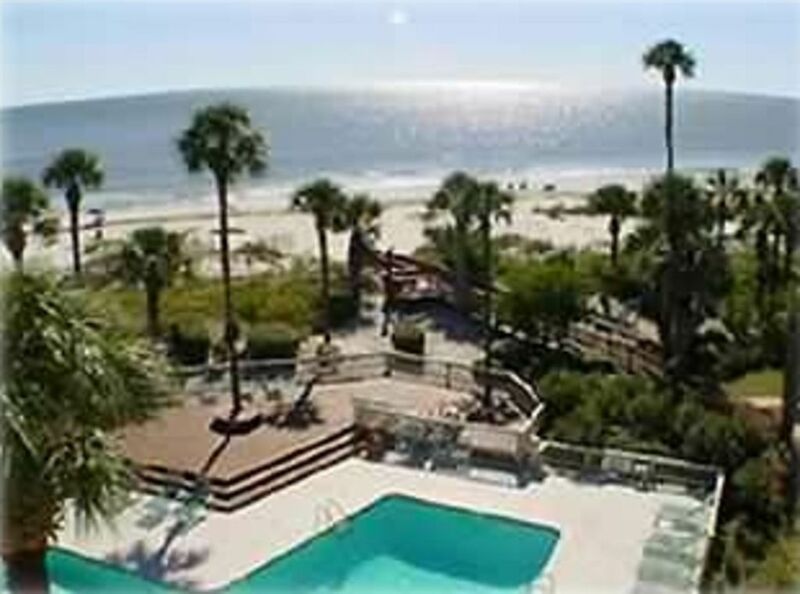 Keywords: Best direct ocean views in HHI! We are Michael and Lori Loughnane and reside in Upper Saddle River, NJ. Michael is a patent attorney and Lori is a real estate agent as well as a volunteer Board of Education member. Our sons graduated from Duke University and Univ. of Colorado and our daughter from Tulane University. They have thoroughly enjoyed Captain's Walk! We have been renting Captain's Walk since June 2003 and have had great rentors! We love being at 449 and know you will too! After searching many villas, we found Captain's Walk and knew immediately this was the place for us. The villa needed some updating which we have done over the years. We absolutely love the view and location. We could sit on the balcony from morning til night! The 4th floor views are the best! This condo is extremely nice and clean! And the view is absolutely wonderful! I can't wait to visit again soon. Loved our stay. The condo was not missing a thing and very spacious, clean and comfortable. Would not hesitate to recommend to others. The complex also had a large heated pool and beyond were the dunes and beach. A Great Place to Stay on the Island. Direct Oceanfront view, overlooking the pool. Nice Breeze from the Ocean, close to many of our favorite Restuarants .Updated Decor and everything you need for a Great Vacation. I would Love to come back soon, and would recommend this place very highly !!!!!! I have been staying at this property for at least 5 years and would not stay any where else. The owners have been so wonderful to work with that I know our stay will be without any problems! The condo has always been in excellent condition and just about everything is provided for our stay. I always feel very welcomed!! I will continue to come back year after year! Love it!!! Thanks so much … we are so glad you enjoy the condo year after year! You are a pleasure to have .. and you know there are so many things to do! Hilton Head has something for just about everyone and the condo is centrally located - right on the ocean, but a short distance from Shelter Cove! This Captain's Walk condo is absolutely lovely, beautifully decorated and updated, well cared for, clean and very comfortable. Best of all is the direct ocean front location. We watched dolphins most mornings from the balcony! Every detail was well thought out, from leaving the parking pass at the gate to facilitating a keyless entry to the condo. We enjoyed day trips to Savannah and Beaufort, and of course lots of walks along the beach. Lori was attentive and made the whole process a pleasurable experience. Thanks, Karen. We are delighted that you enjoyed our "home away from home!" Hassle free vacations are our goal! Thanks for returning year after year! We're glad you enjoy 449 as much as we do! Biking (on bike path and on the beach too), Bike Rentals, Discount Malls, kyacking, canoeing and rowing nearby, Beautiful sunrises right from your balcony! We try to maintain 449 as one of the best units in Captains Walk! We work hard to maintain our excellent five-star reviews! Pls email for rates!